Korea's Information Society: Schmidt: hangul (한글) "in line with Google's mission"
Schmidt: hangul (한글) "in line with Google's mission"
Google chairman Eric Schmidt was in Seoul yesterday and, although he met with Samsung executives, perhaps the most important activity during his visit was a visit and press briefing at the Hangul Museum being built at the National Museum of Korea in Yongsan, central Seoul. As reported in the Joongang Daily, "Schmidt held a press conference yesterday morning at the museum to announce a set of new partnership programs to help expand the user base of Hangul, Korea’s written language, including developing a Web program for learning it. 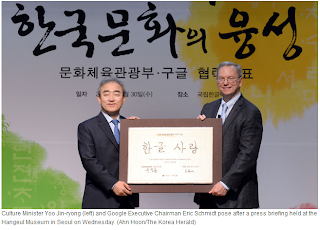 Schmidt said King Sejong’s purpose in creating Hangul, which was to provide Korean people with a language essay to learn and use, is in line with Google’s mission to “organize the world’s information and make it universally accessible and useful.”"
Google has already made some effort to publicize hangul to the world, including its use on Google's main search page on Hangul Day, a national holiday here in Korea, as shown in this 2011 post. However, it can and should do much more, for several reasons. Some years ago, a poll of academic experts on Korean culture published in the magazine Koreana showed that hangul was considered to be Korea's greatest cultural achievement. A similar poll of the Korean people would no doubt produce similar results, as hangul is widely considered to be this nation's crowning cultural achievement. Moreover, as I noted in a 2009 post, hangul has the following characteristics (I've updated the list slightly here to account for recent developments). Because it is so scientific and phonetic, it was an important factor in accelerating the uptake of computers, mobile phones and all sorts of digital electronic devices here. It is possible to type much faster on a hangeul computer keyboard than on a qwerty English keyboard--much faster! This principle applies to smartphones and tablets as well. Because Hangeul is alphabetic, it was conducive to the rapid development and growth of the graphics industry, which began back in the 1980's. Some of us remember when there were no Korean fonts, only hand calligraphy. Literacy is an essential requirement for the information society and Hangeul helped promote it in Korea. For years now, South Korea has had near-universal literacy. Despite the above realities, a 2003 report by the International Telecommunications Union (ITU) entitled Broadband Korea: Internet Case Study, got it completely wrong. In Section 1.2 of the report headed "What explains Korea's success," it claimed that "Another factor seemingly weighing against Korea’s ICT development islanguage. Koreans have their own language. Therefore, the country cannot easily leverage the vast amount of content developed in more widely spoken languages. The Korean alphabet, known as Han-gul, uses a pictographic font that is not ideally suited to computerization." This blatant mistake in the ITU report is symptomatic of a larger problem, that treatment of Korea in the mainstream media around the world (and this carries over into internet content!) tends to be overwhelmed by the much larger volume of information about China and Japan, Korea's two larger neighbors. Nowhere is this more evident than in efforts by the current Japanese government to claim that Dokdo, the Korean island in the East Sea, is part of Japan. More on that in a future post. Curved phones or build your own? Why the dark cloud over world TV market? Is Samsung overly reliant on smartphones?